Sustainable Mango Cottage is the Aloha Maui Cottages 2 room deluxe ocean view suite. There is a hand-crafted king size bed and comfortable queen size bed and double fold-out. The full kitchen is furnished with all the necessary gadgets with a service for four and has a large wooden dining table overlooks the ocean. The bedroom has a high ceiling with huge windows allowing you a beautiful view of the sea by day and the Hawaiian sky at night. The full bath has an isolated view window, which looks out on a garden of shell ginger. An opaque skylight allows brightness from the sun and moon. A small South facing porch is furnished with BBQ and a bistro set. Satellite TV is available by request. Sustainable Mango Cottage is perfect for a couple or family of four and has sufficient bedding for up to 6 individuals for a shorter stay. A washer / dryer are available as well as sauna and free use of mountain bikes. 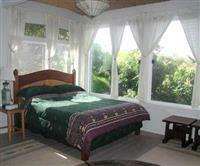 The Cottage rate is $120 per night (3 night minimum stay) and by the week (7 night minimum stay) $100 per night. High season rates are $135 per night and $120 per night by the week. Additional costs for more than 2 people are $5 per person for bedding per night and $7 per day (for the cottage) for Satellite TV. Optional maid service is available for $25 per day. Please use the Contact form on the right for Sustainable Mango Cottage information and ordering. Your message will be sent to Aloha Maui Cottages only. Privacy & Anti Spam protected.